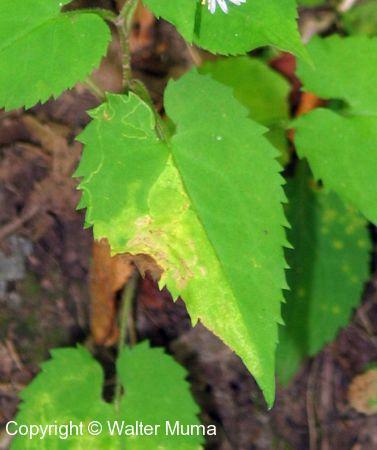 Distinctive features: Heart-shaped leaves. Flowers in a dense rounded panicle (ie, not flat-topped).  Azure Aster (Symphyotrichum oolentangiense) - leaves of this species are in between Arrow-leaved Aster and Heart-leaved Aster.  Arrow-leaved Aster (Symphyotrichum urophyllum) - leaves not deeply cleft at all. 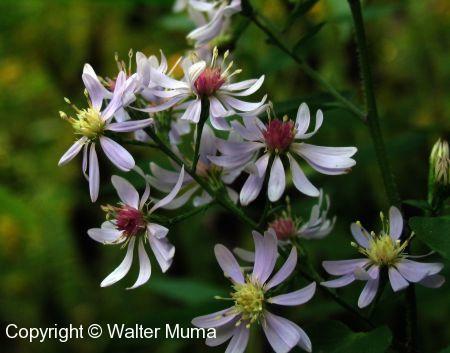  Large-leaved Aster (Eurybia macrophylla) - leaves much larger, not as deeply cleft. Flowers in a flat-topped head, usually white. Flowers: Summer, Autumn; Blue/Violet; 7 or more parts (petals); 1.5cm in diameter. Ray flowers: 8-15, pale blue, blue-violet, rose, or mauve; sometimes white. Disc flowers: 14-20, yellow becoming purple. Flowers are arranged in a rounded panicle in dense clusters. 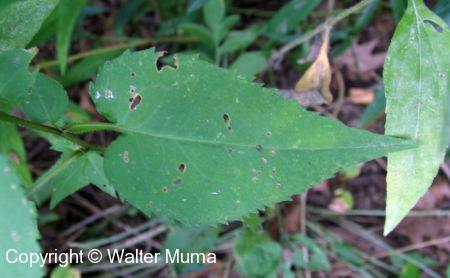 Leaves: Alternate, Simple, Toothed; Basal leaves are heart-shaped, with a very deep cleft at the base of the leaf. Upper stem leaves are still somewhat heart-shaped, but without a deep cleft, or have a much shallower cleft - resemble leaves of Arrow-leaved Aster (Symphyotrichum urophyllum). Conspicuously & jaggedly toothed. Habitat: Forests, Fields and Open Areas; Open woods and edges of woods. Notes: This is a fairly easy Aster to identify, and is fairly common. The leaves are distinctive, but they may be confused with the similar species listed above. Photographs: 148 photographs available, of which 11 are featured on this page. SCROLL DOWN FOR PHOTOGRAPHS. The flower head. Note that the flowers are in a rounded panicle. 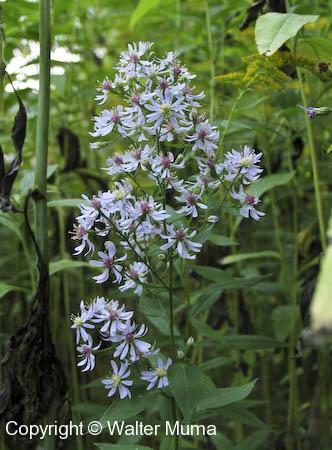 This is in contrast to Large-leaved Aster (Eurybia macrophylla), in which the flower head is flat-topped. A patch of the plants in mid-September north of Sudbury. Here's a more open form of this species. Note that they are typical Aster flowers in that the discs start out yellow, and gradually turn purple. A typical leaf. Note the jaggedly saw-toothed edges. This is in contrast to Large-leaved Aster (Eurybia macrophylla) flowers, which are not so prominently toothed. Notice the shape of the notch at the base of the leaf - this is distinctive and is a reliable identifying feature. Sometimes the leaves are "stubbier".